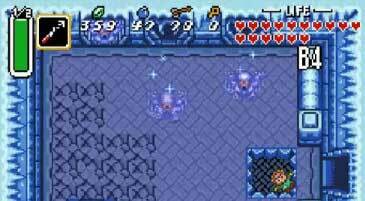 The Freezors are minor enemies in Zelda 3: A Link to the Past and appear mostly in the Ice Palace dungeon. These fiends hunt Link down and the only weapons to stop them are the Fire Rod and the Bombos Medaillon Spell. The sword does not even knock them back! Carlzors illustration of the Freezor made for Link’s Blacklist was based on these little sprites of the Freezor you can see in the screenshot since no official art for these enemies was ever published (as far as we know).